If you have read any of my recent posts for this blog, you will already know that I’ve been thinking a lot about ways to use smaller pieces of fabric you may have in your stash. I find it very frustrating when I have a great piece of fabric, perhaps in an amazing print or a luscious colour, but there’s not enough for a whole garment. But I know that, with a little applied creativity, these pieces can still be incorporated into a garment. The Macaron dress is an awesome example of a pattern which calls for a smaller piece of contrast fabric. Just check out the gallery to see some of the inventive fabric combinations some seamstresses have used. 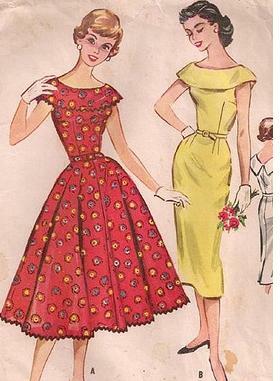 Do you have a dress pattern with a waist seam that could be made in two fabrics instead of one? Vintage patterns, in particular, often call for so much fabric that splitting the total amount of fabric required into two smaller lengths might mean you are finally able to use some of those special stashed away treasures! These dresses below could look stunning made with two contrasting fabrics. Imagine the variety of looks you could create from the same dress design! It’s funny you should mention this! 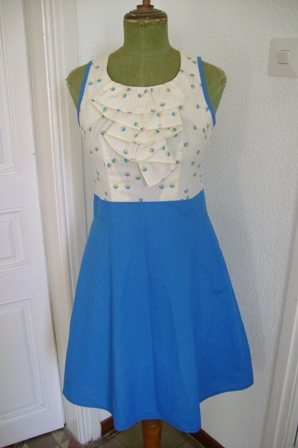 I have number of 40s and 50s patterns that show dresses made up this way, it’s a look I really like. I have sworn to tackle dresses this year and I think it’s the way to go! This is really just a muslin, but I think it looks pretty cute nonetheless. Your coffee date turned out wonderfully, too! Your Rooibos is LOVELY! The fabric combination makes it really unique. What about blouses? You could do the yoke and pockets if there are any in the contrasting fabric, and use cover buttons from the same fabric too. Or if there’s a band collar you can cut the collar and band facing out of a contrast fabric. Oh I love this idea! This is such a great post! Thank you Zoe! I think its a great excuse to use some of those crazy prints that I love so much. Breaking it up can really add fun but not crazy feel! Great ideas! I really like the coffee date dress done in two fabrics. From far away it looks like a blouse and skirt combo, without having to worry about keeping the blouse tucked in! What about using printed contrast for a hem facing – that way, you get just a lil peek of your fabric as you walk? Just another way to make something feel more special and one-of-a-kind. Anyone have the pattern number of that last one? Thank you for this post – it is very timely for me. I recently received some beautiful fabric from Liberty that is not quite enough for a blouse but I don’t want to hide it in the lining of a bag. So, my hunt for dress patterns with a seam at the waist or bust begins! Yes! I am always on the lookout for patterns that lend themselves to using small bits of interesting fabrics. Aside from random remnants, I’ve collected an assortment of vintage kimono fabrics, and am always looking for ways to use them to best advantage. Tricky because mostly they are just smaller reclaimed pieces, and they are only about a foot wide anyway. Also tricky because I find myself drawn to patterns just because I can see potential to work in small/narrow bits of fabric, when sometimes I never would have looked twice at the pattern otherwise. Which is a waste for a piece of fabric that if I’m going to cut into, I want to be really wearable, if not heirloom-worthy! Need to be honest with myself about liking the pattern on its own merits too. The Rooibos I’m working on is using a favorite short lengths of kimono fabric- a new rather than vintage, but wonderful blue crosshatch pattern- for the contrast. I’m really excited to finally use it after hoarding it so long (Stashbustin’!). These little bits and pieces are really great for making fantastic fabric belts out of too- and contrast covered buttons. Also, there’s a Rooibos in the Colette Flickr page right now that did a really genius thing by using some scrap Liberty Tana lawn to make her own piping, as well as the contrast- I love that, and wish I had thought of it myself before using cheapy-looking storebought cotton/poly piping! Nicole- I LOVE your Rooibos, I never thought to do the bodice itself in a different fabric. Fantastic idea! Or sleeves-and-collar, if you like the (what Americans call) “jumper” look. (What’s that in British English?) 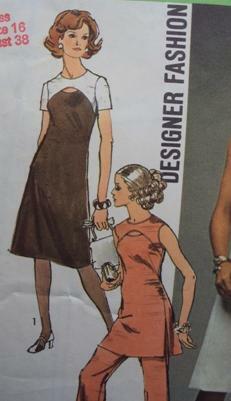 I’d like to do that McCall’s dress with a contrast collar. 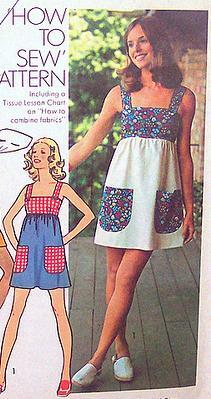 Does anyone know where the tunic pattern (in the images above) is from – I love that??? ?